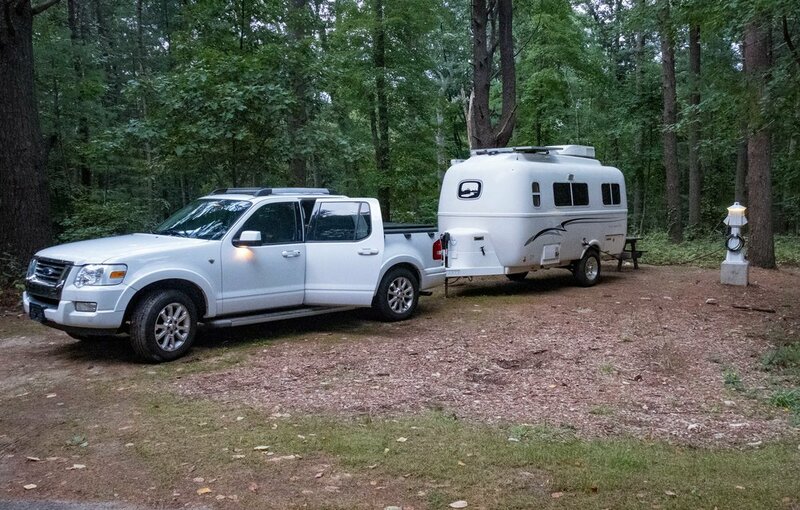 We stayed at two campgrounds, one near Columbia SC and one near Charleston SC that were marginal at best. The first was a small campground -cash only - with full hook-ups and semi-working wifi in a rather unfinished setting. Wood Smoke Family Campground was not much of a place to enjoy the outdoors but, it was close to where we needed to be on Sunday morning and it was inexpensive. I would stay here again in similar circumstances if there were no other options. The second was a KOA in Ladson about 15 miles west of Charleston. This, too, had full hook ups but very poorly maintained. No covers on the sewer connections, for example. Our water spigot did not work correctly and there were high weedy patches and low standing water places on our site that backed up to the fence that separated the KOA from a rough looking trailer park. The KOA had lots of seasonal workers using it while they were in town for construction or other jobs. Then there were the military jets all night which would be fine if they had mentioned that in the park information.I wonder how they keep the KOA rating as it was not one that I have found typical of a KOA. I would not stay here again. We are in the newer campground with concrete slabs to park on, water, sewer and electric and a very iffy wifi. We can hear the surf a very short distance away. The older “north” campground has more space and trees but fewer services. I had made an error in registrations but the staff were very patient and helpful (Thank you, Deb & Don!) and we got settled yesterday afternoon. We camped here is a tent in 1974 and in 198? with two kids and a large cumbersome trailer and that time for Thanksgiving. It was my favorite camping spot. Still pretty close call. Beautiful beach, nice ponds with alligators and lots of birds and a very unique old estate to tour. We took a 2 mile beach walk late afternoon between rain. Lovely. Brookgreen Gardens is across the street. Cost was about $60 with full hookups. I was going to post this in Alaska but it is really the every spring task and some it it each time we travel as well. 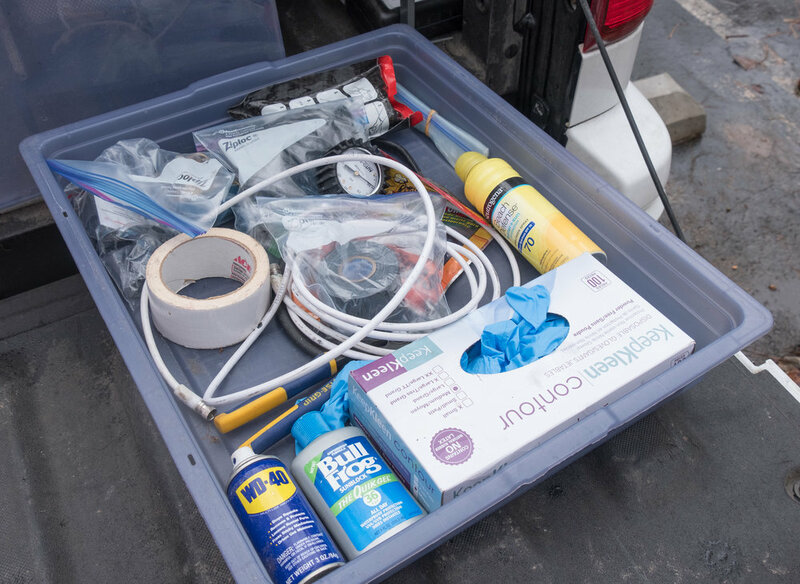 These are all things that go in the truck. I have just started to sort and replace, clean and repack things. We carry water, tools, generator, fuel, grill, hiking boots, air compressor, dirty laundry, spare parts, trailer hook up stuff - hose, power cord, blocks, and extras, like sleeping bag if it gets really cold, hiking sticks - lots of things that can get dirty. We store most things in clear boxes with lids. First box nearly done, two things are here temporarily and a couple are missing. We do have extensive check lists to keep track. This is the shallow box that slides in a frame and is under the water hose, power cord, filter and electric surge protector. This is the last item I think we may need for support on the trip - actually any trip. Now I have a compressor, a screwdriver and duct tape, what else could you need. Twice my truck has failed to start and both times I was able to use jumpers to get started. Off in some National Forest miles from help and surrounded by hungry bears I don’t want Cindy to have to walk for help so I bought this little charger. I have not used it but it was highly rated on two different web sites. It is well packed, small and light weight. It has power to jump a battery 10 times if fully charged and it will do cell phones, laptops, etc. So when it went on one of Amazon’s special day sales I bought it. I would be glad if I never have to use it but even happier if I do and it works! Seems like a great thing to carry not just while camping but on most trips. less than 8 inches long and about 1 inch thick, easy to store and I imagine easy to use. 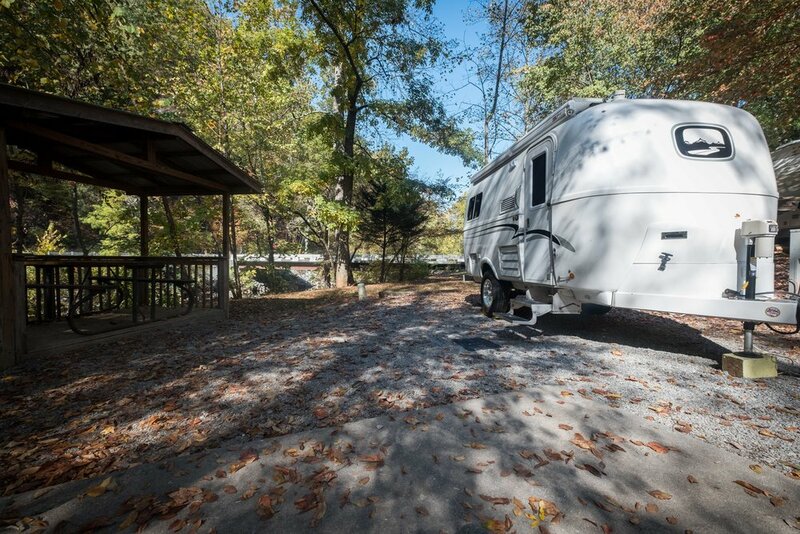 I don’t recall the name of this campground but it is at the exit of the Natchez Trace Parkway at Route 412, the road that leads down to Hohenwald and at the Oliver Trailer sales office. Once you pick up your trailer they assign someone to do an extensive walk-through of all the systems and then you take your new trailer up a few miles up to this commercial campground where they assist you in setting everything up and will aid in the AM if you need help on breaking camp. It was helpful and a very nice idea just not a very nice campground. It was weedy, uneven and poorly drained so it did not make a great impression. In fact, it was likely our least favorite place we have stayed. 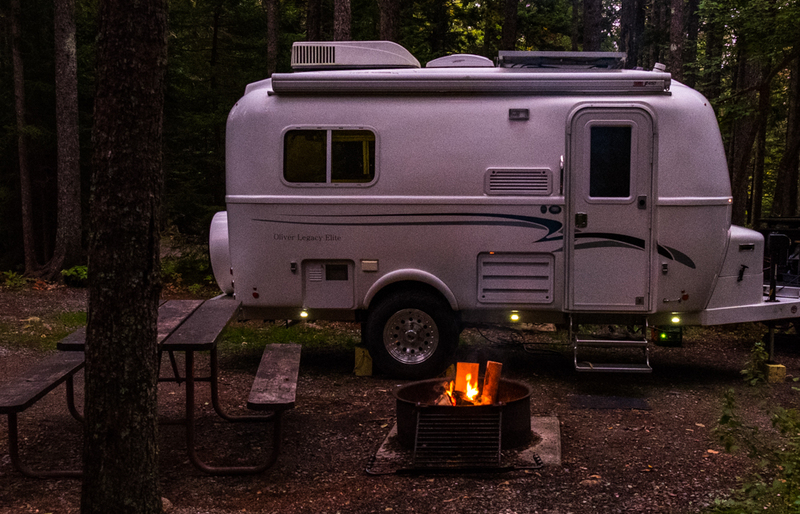 There are so many beautiful places near the town and I imagine Oliver could set up a 6 or seven spot campground on property they own or could buy and really do a first night well. Location does influence your experience and while the trailer was great the environment was far from ideal. If you are going to provide a service to your guests and customers, it ought to be the best you can do. Here much of the experience is out of Oliver’s control and leads to a less than great event. Pretty trees but not much else to recommend this place. We are often told that communication is a key for a successful marriage. This may be true but it is clear that if you want your marriage to work while backing a trailer into a camp site, you need to not just shout instructions you need a plan! We struggled to get this done. I think largely because of my lack of ability to actually back up the trailer let alone back into a rock and tree-lined site designed by M. C. Escher. Enter help via walkie-talkie. 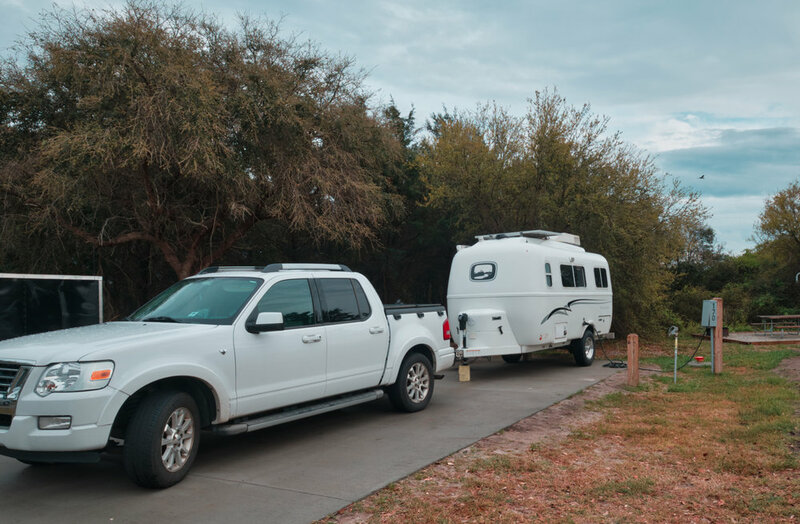 This was not our idea but the recommendation of the folks from Long-Long Honeymoon who have an excellent YouTube channel on the joys and travails of RV travel. (Mostly joys) We bought these two made by Arcshell with chargers from Amazon for just a bit under $25 and they work really well. The sound is clear, they announce your channel so you don’t have to guess, they hold a charge for many days and we look very cool using them. We first tried to use our phones but often - and usually with the most challenging site, we would not have cell coverage. We used these several times on our last two trips and they made slotting into a camp site a much easier job. We even followed their suggestion that we drop left and right and use passenger side and driver side, very helpful. Highly recommend. And while we have linked to Long-Long Honeymoon for a long time in our Connections tab here is their web site - http://longlonghoneymoon.com, go and be inspired. I found quickly that I needed organization for the things I needed to set up the trailer. The box I had dd not really work and all the stuff needed did not fit and everything needed to be in one place. So I found this closet organizer at the Container Store - a very dangerous place for me. In fact in nearly four years in Raleigh I think I have earned my own parking space out front with a sign and everything. Anyway, this was on sale in January two years ago and I bought it. It has three drawers - you need the metal ones for the top two. I secured it in place with two velcro ties and they keep it from sliding around. 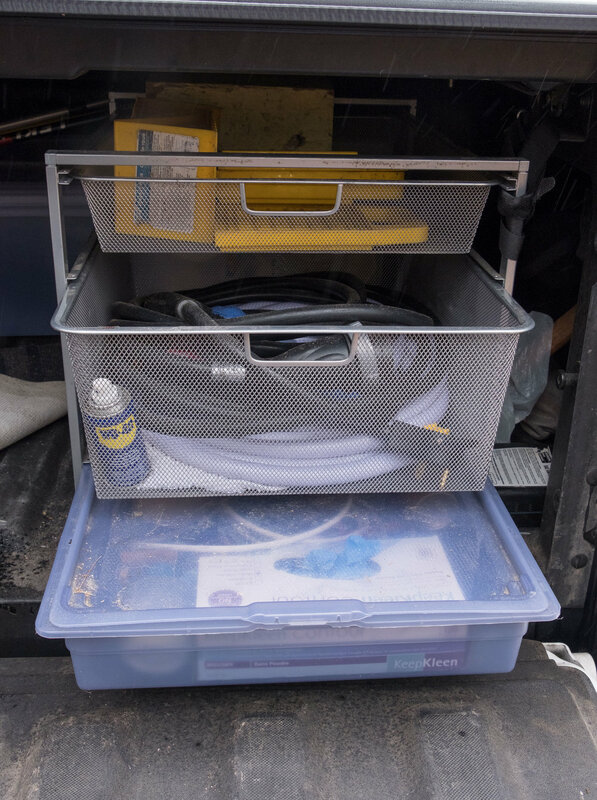 I keep blocks on the top row, electric connection, water hose, filter, cleaning rag and electric surge protector in the second and the third gets little things, hose wrench, gloves, oil, small parts, tapes, repair parts, rags and more. The lid is important for this one to keep stuff clean because dirt filters down from the top. In four long trips it has been perfect. It all fits behind the tailgate and under the cover. Everything is easy to get to and put back. This cost about $75 on sale and has been well worth the investment. I stayed here four days for a photography event in the GSMNP in fall of 2016. I was in a nice spot by the creek and it was quiet at night as the campground is the very last thing before entering the park, so no traffic at night. It had on site water, electric, sewer and cable and was about $55 a night. Way less than staying at the lodge for the conference but more than I would normally spend. Still just fine, convenient to the park and well kept at the time. I parked at this church on Saturday evening - with their permission, of course. 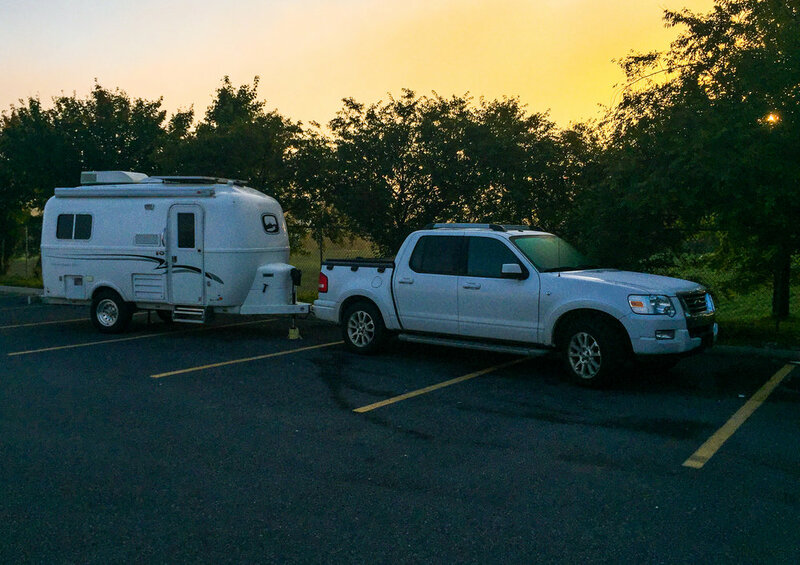 Turned out to be a really nice night, easy place to park and easy to exit in the morning. But do go to church if you ask! I have a bit of a relationship with these folks so I was not coming to them as a stranger. Still, very nice of them and perfect for us. We chose this park for its proximity to Boston and access to the ferry system. It turned out to be an excellent choice for several reasons. First, the park was priced fairly, about $27 a day for out-of-state with electric and water. I really liked the electric stations that were lit at night and had holders to keep the cord off the ground. (it was also easy to see for those of us with poor back up syndrome!) The site we had in the first loop on the right was D007. It was level, had a nice table and fire ring and the site was well spaced with lots of trees. We were about a 10 minute drive from the ferry terminal and since we were going to the NP on a weekend parking was free and the ferry - $15 to Boston. It is fast and convenient. We went first to the Boston Islands NRA, specifically Fort Warren. The second leg was from the island to the dock in Boston. There we spent a day seeing the African American Park and Revere’s house. We also had dinner, dessert and a great walk. Hingham is the home of Talbots, so, just a note you can shop in the original 1948 store and they they have a factory tour which we missed but one of us is a big Talbots fan so when we come back, not only is that on the agenda but we will stay at Wompatuck. Nice Walmart night at the intersection of Rt 37 and Rt 50 just a tad west of Winchester. Quiet spot near the garden center, except for a Walmart truck that arrived late and ran his generator. Did not really cause any issues, I just noted it when he fired it up sometime in the night. There were also three options for coffee in the front of the lot, and I am returning from my choice, Dukin Donuts, with coffee and maybe a pumpkin munchkin, who knows, just a bit after 6:30. This was an odd sort of park. It had a lot of spaces but most were closed by the time we arrived in early October. We got a space that offered electric hookup but while they were on the lake side of the highway, you could not see the lake and you were mere yards off that same highway, Rt 89, so you heard traffic noise and there was no foliage barrier between you and the road. The sites were not well spaced but level. There were two bathhouses - we were not in either so no report on how well they were kept. The cost was reasonable, about $27 a night. Still it was well suited for our visits to Auburn, Seneca Falls, Rochester and Geneva. So, no complaints. We arrived here on a busy weekend but not a race weekend. A Friday night only stay on a 3-day weekend is not always easy but there were spaces at the park - only with no electricity. That was not an issue for us so we slotted into site 23 on the second loop. The cost was under $30 for out of state residents. Our site was difficult to get into, at least for me, but fine once I got parked. It was level but a bit muddy. The other advantage is that you are in the park and can walk - long walk - to the Glen and that is a fantastic place and well worth spending some time there. There are a lot of steps and it was raining slightly but even so, you may get a bit wet as you walk under two or three waterfalls out of the 19 in total. This was a nice spot overlooking the ocean. We were in row two and there are no electric or water hookups. We used our generator for the first time to make coffee in the morning. Not the reason we have it but a nice perk. (Please note the hard earned pun!) The park was about $30 for the night. It was convenient for visiting New Bedford Whaling Historic site. The pretty sunset a bonus. Nice place - great location. You are 15 miles from Frederick just three miles off I-270 and a 20 minute drive to the metro to DC. They have full hook up sites, nicely spaced and wooded and lots to do if you just hang out in the park. It was a little more than we would normally pay but with Passport America it was right in line at $32. The easy access to the interstate, base for DC or Baltimore make it a bargain. We camped here for two nights as a prelude to our fall trip. We had added some gear and wanted to try it out in camping conditions. Worked great. We also added some new hooks and other things designed to make camping easier and all but one of those also worked well. Morrow Mountain State Park is in the central Piedmont portion of NC. It lies south of High Point and east of Charlotte near the town of Albemarle. The park is a decent size with a long lake on the northern and eastern boundaries. There are three camping areas but only one (C) has power. We stayed in site 100. It was short and steep. Easily the steepest site we have ever used. The front of our camper was on the ground to get level. People were nice but the park could use a bit of attention. It was a CCC built facility with beautiful stone buildings quarried on site but showing age. The pool is a work of art. We took three hikes all OK but not great partly because it was so beastly hot and humid. The cost to stay was reasonable about $20 a night for seniors. It suited for our purpose but I doubt we would go back, too close to actual mountains for the slight bumps at Morrow Mountain. Steep site easier to see here, along with the table, lantern hook, fire ring and the nicely spaced sites.